Here's something to add a little spice to your reduced-fat life! And it is the highest scoring (99.2) reduced fat cheddar at the U.S. Championship Cheese Contest (March 2007). 1. Spread four tortillas with 1/4 cup refried beans each. Sprinkle each with one-fourth of cheese and one-fourth of green onions. Press remaining tortillas on top. 2. Set large (8-inch) skillet over medium heat until hot. Place first quesadilla in skillet and cook until browned on underside, about 1 minute. Turn with spatula and cook until quesadilla is browned on second side and cheese is melted, about 1 minute longer. Repeat with remaining quesadillas (keep cooked ones warm in 200 degrees oven if not serving immediately). 3. Cut each quesadilla into eight pieces and serve topped with sour cream and salsa. I can't find this product anywhere else! I Would like to see it in more stores! Love the peppery taste of this cheese. Very good cheese, eeven if wasn't reduced fat. I cut it into 1 oz cubes and eat it as part of a high protein, low fat, and low carb dietary regimen designed to keep my blood sugar under control. 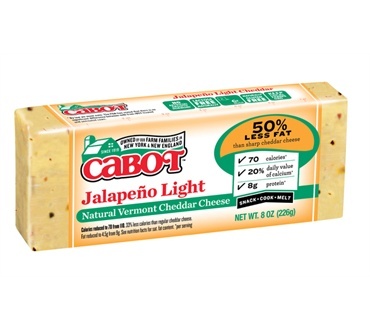 I thought I was going to have to give up cheese altogether until I found this product. My thanks to Dakin Farm for making it available!